When I was growing up, one of my favourite places to hang out was Ed's Diner on the Kings Road in Chelsea. 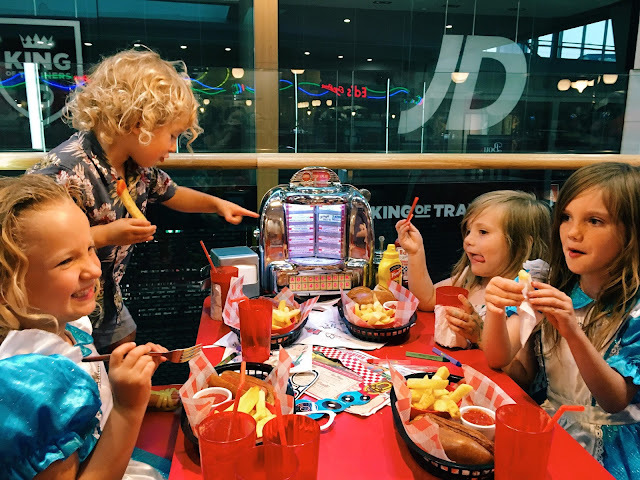 My friends and I would go in for a milkshake and some wet fries every weekend; we loved the vintage American vibe and you got a lot of milkshake and fries for your Saturday job money, plus their famous jukeboxes played all our favourite 50s and 60s tunes! 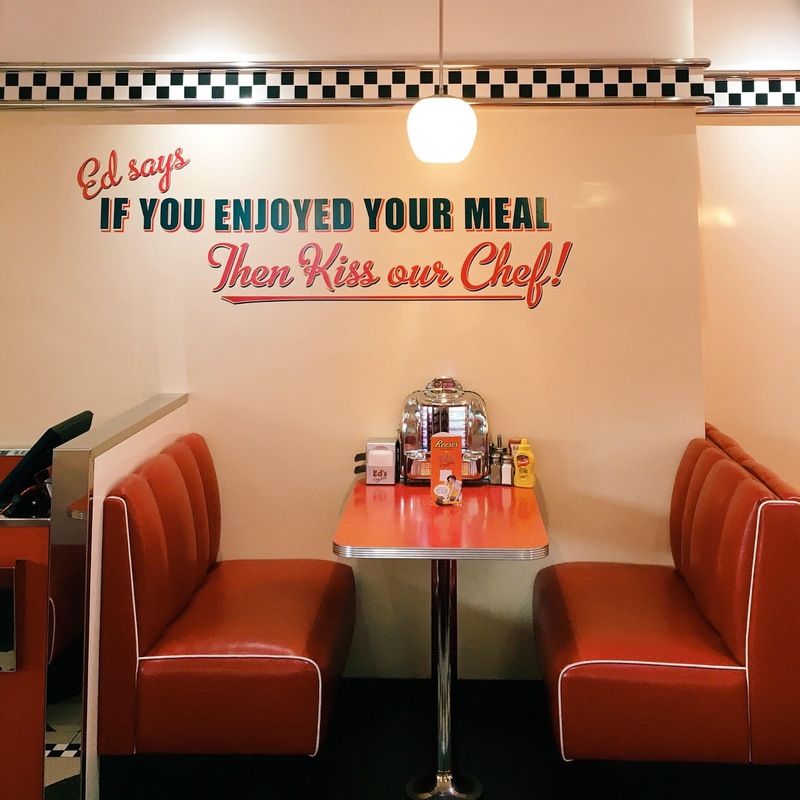 But then the parade of shops that 'our' Ed's Diner was a part of was demolished and the restaurant was no more and, although other Ed's opened in different areas of London, I never actually visited any of them; I just didn't think they'd be the same. Then I grew up and eventually left London altogether and, if I'm honest, I didn't hear anything of my old favourite haunt until last week, when the girls and I were invited to sample the menu at the Ed's Diner in Norwich! As we were in town visiting the RocknRoller Baby family, we took them up on their offer and, after a long day at the beach, six of us piled in for a much wanted feast on our way home. 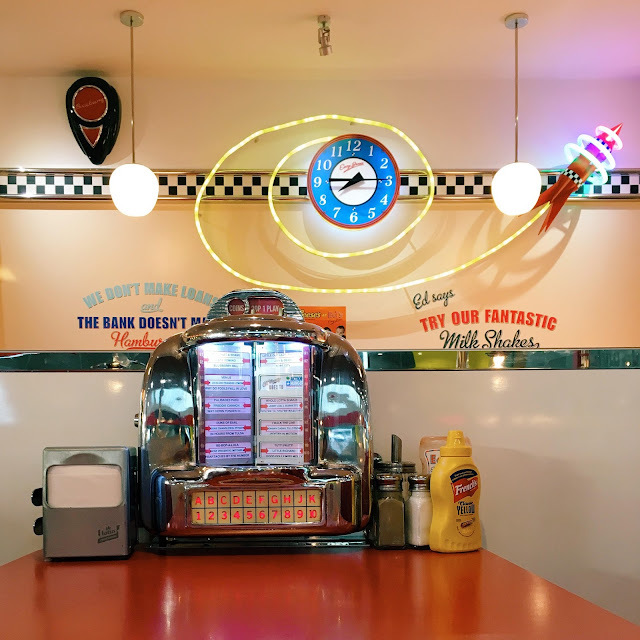 Although this particular restaurant is in a modern shopping centre, that retro vibe was still very much present and I had all sorts of flashbacks walking in there for the first time in over a decade! With the same vintage decor, and jukeboxes in every booth (which were still only 20p a song!) 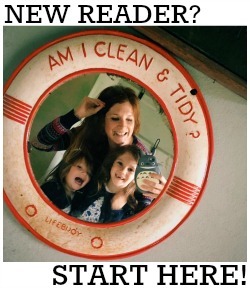 I remembered exactly why I had loved the place so much in my youth, and straight away the girls seemed to love it too. We sat down in our booth and were handed our menus. 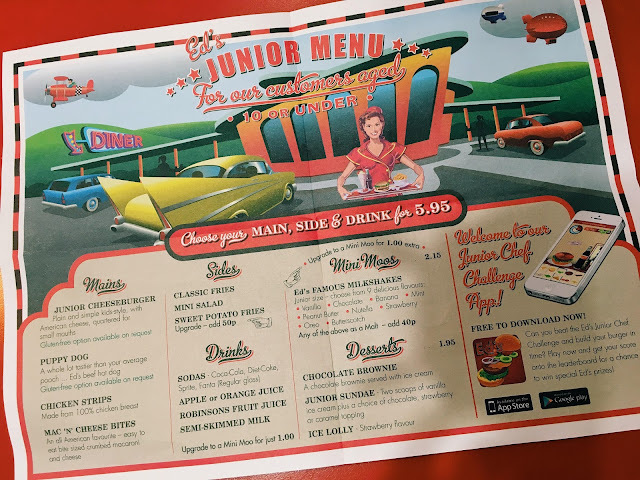 The kids also got a brilliant kids pack, which I have to comment on as it was, without doubt, the best and most up-to-date kids pack we've ever been given at a restaurant. Everyone was given a little Ed's bag which contained the usual puzzles and crayons, but also a Photo Booth frame and props to take silly photos. Everyone loved them and they helped to successfully keep the children entertained long after our meals had come out too. We kick started our Ed's experience with Nutella milkshakes (for the kids) and bottles of Sam Adams for me and Ruth, plus some Mac n Cheese bites and mozzarella sticks for the littlies to nibble on while we looked over the menus. 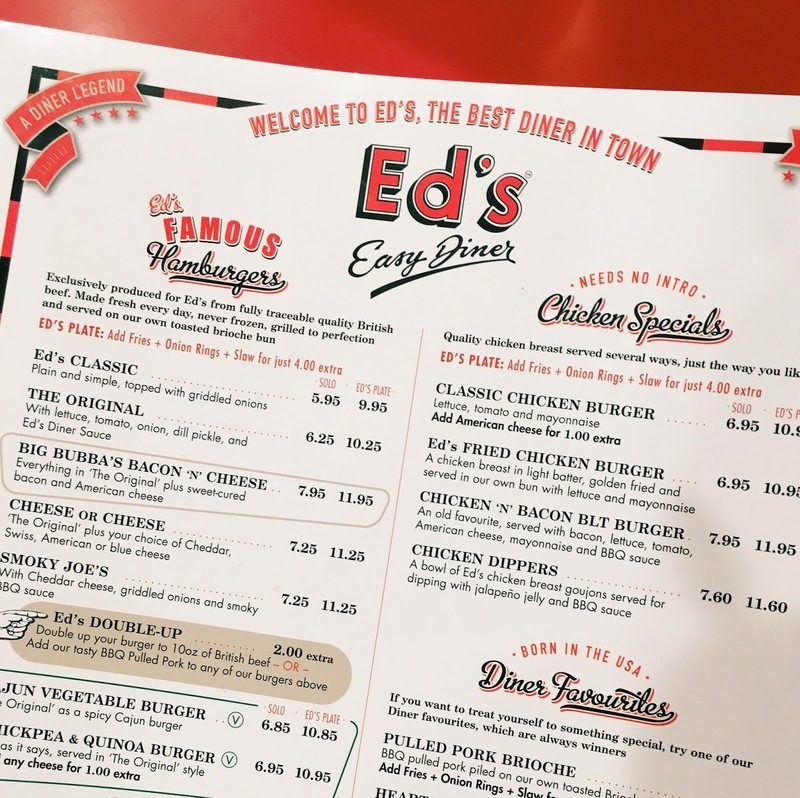 Ed's is a little more expensive than your average UK burger joint, but the quality of the food is exceptional - and the staff in the Norwich restaurant were brilliant too. In my usual forgetful style, I omitted to mention my dairy intolerance before we went but Annie, our server, was very knowledgeable about all the ingredients and was able to help me pick a suitable meal. I went for the chilli dog but in a gluten free bun (they come in a brioche bun as standard which contains milk). I also had chips and onion rings as part of the Ed's Plate meal deal and, again, substituted the coleslaw (which contained dairy) to the jalapeño jelly, which was SO GOOD! 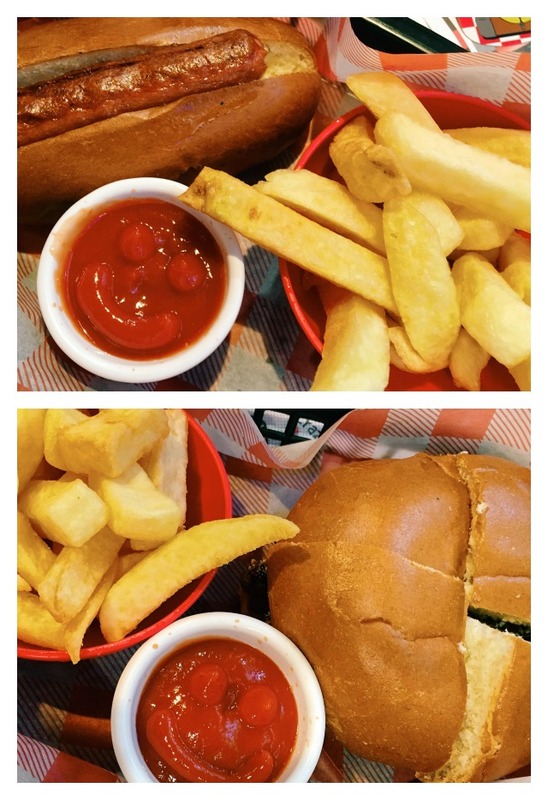 Daisy and Evie ordered the junior cheeseburger and puppy dog (mini hot dog) and both went down a treat. Everybody was very excited by the smiley faces in the tomato sauce! I wasn't quick enough in getting any photos of the girls' desserts.... Daisy ordered an adults portion of the waffle s'more with Nutella and ice cream (like she hadn't had enough Nutella already ;)) and Evie (surprisingly!) went for the healthier option of a fruit ice lolly. Ruth's kids had pancakes which were absolutely huge! 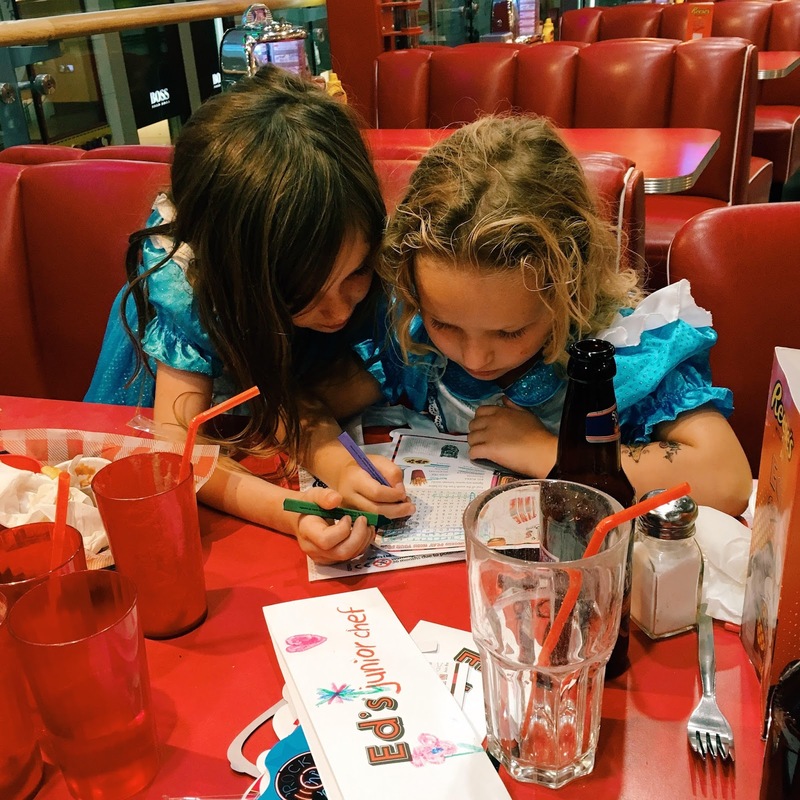 Desserts aren't part of the kids meal deal at Ed's but for £5.95 you do get a main, side and a drink and pudding is only an addition £1.95. 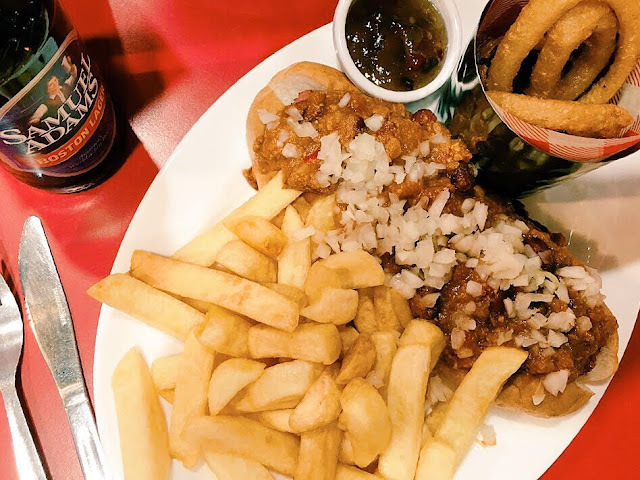 Unfortunately there weren't any dairy free options on the adults dessert menu, although I was offered a fruit lolly from the kids menu - but I was so full after that chilli dog that I was more than happy with an espresso! 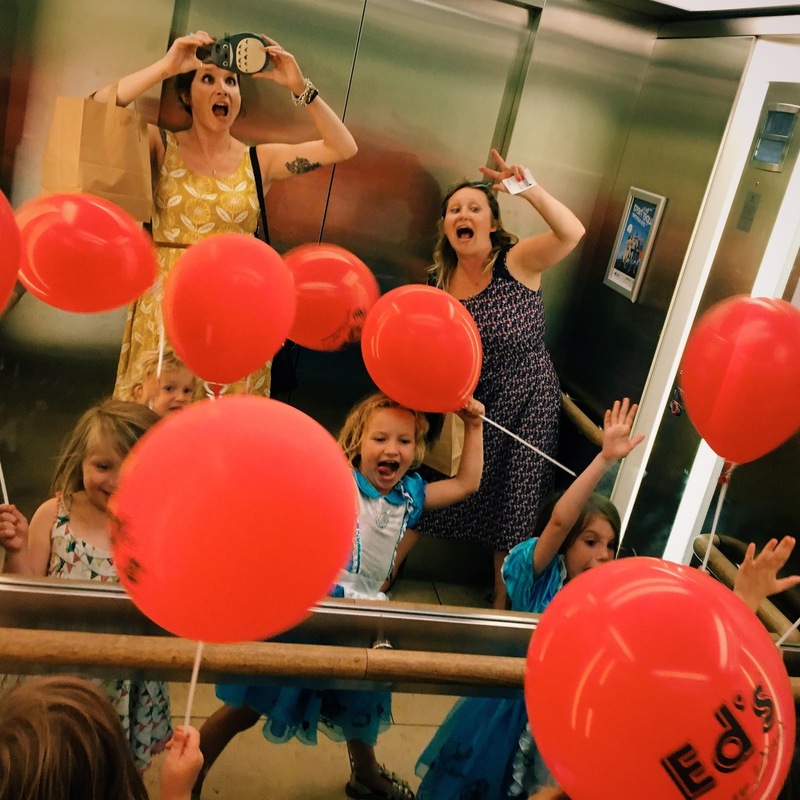 We left laden with balloons and with bellies full of delicious American food - and with plans of what to order next time we visit (which will definitely be soon!) We need to work our way through the menu! 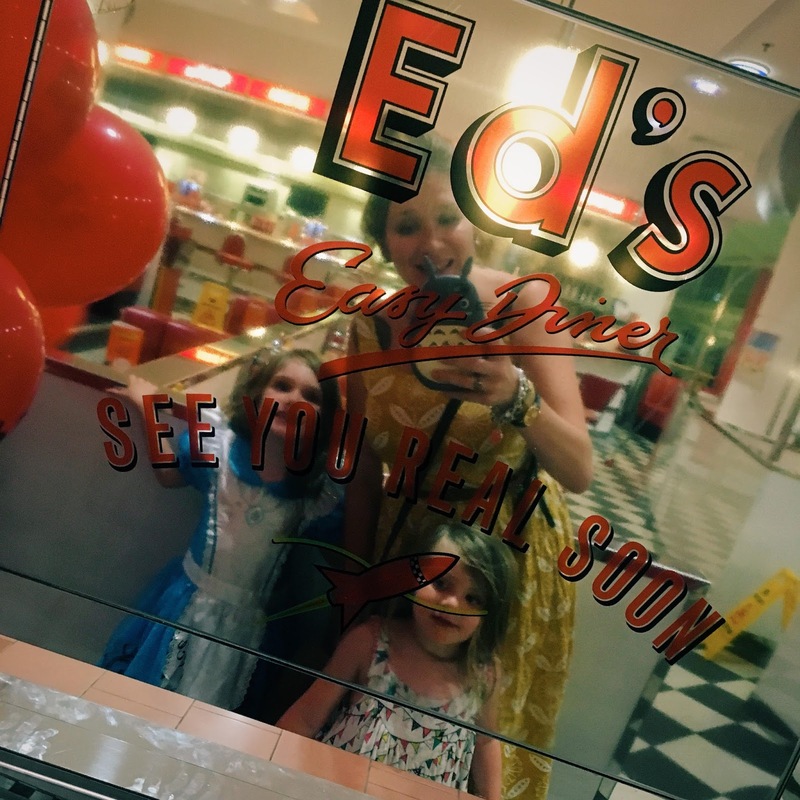 Thanks so much to Ed's Diner for inviting us down, and special thanks to Annie, our server, for her dairy free knowledge and for being so good with the children! We were given a complimentary meal in exchange for this honest review. All words are honest and images are my own.